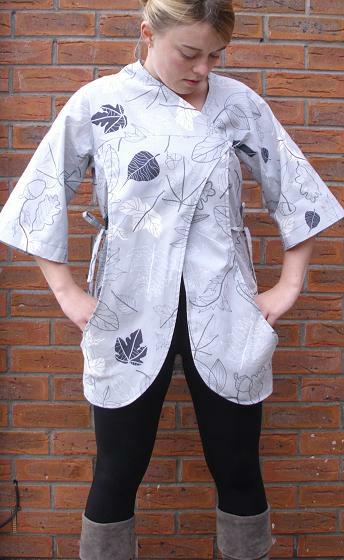 So this is another Burdastyle free pattern creation...this time the Naomi kimono jacket. I don't know why i really wanted to make this so much....it's not something i would usually wear, but i really wanted to do it! I love the cool pockets which extend all the way round...so useful! And while it supposed to be a bit billow-y, the side straps allow you to pull it in a bit so you don't look massive! It was a bit of a jigsaw to put it together...there are a million little pieces and it's hard to see what is going on until the end...then you're kindof like..."o it goes that way - I get it!" Don't know if i'd make it again..i prefer stretchy clothes, but i don't think that would sit right in a knit...plus it uses almost 3 metres of fabric....another reason why i chose a cheap ikea curtain material!! !...can you tell?? Beautiful kimono! I love the fabric!